Monica offers a discount of 25% on their first / introductory lesson! 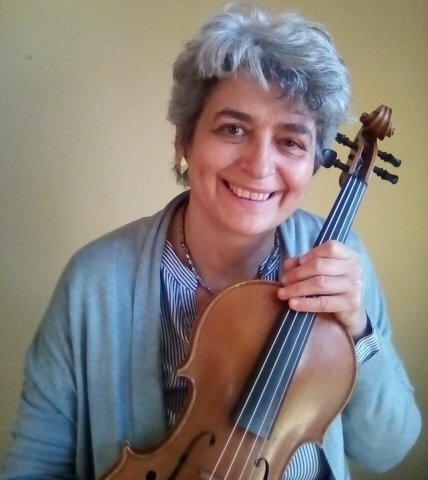 I am a professional viola player, with over 20 years' experience playing in orchestra, chamber music, as a soloist. Also play folk music (especially good for beginners). I graduated in viola in Italy. I teach violin and viola. I have a long experience as a teacher, specialised in the prevention and release of physical and emotional tension related to performance that create a lot of problems and difficulty. I translated three books on this subject. The method I teach enables the students of any level to learn and progress more quickly, improve their tone and play with more ease; beginners can produce from the very first lesson a lovely tone. I also offer online lessons via Skype, for those who cannot travel or for travelling periods. I also help professional violin and viola players play without aches & pains, tendonitis & stage fright through my 6-week coaching course.